By Sheila - Australia - 13 Sep/03 - Viewed 1750 times. In Port Steven we stayed at Roches Resort which is very sport orientated. All the facilities are free including the floodlit tennis court. We had a game after dinner but the wind was very strong and quite cold! There is a Tennis Academy operating there and we wondered if there is a Tony Roche connection. There were a lot of photos of him on the walls as well as other tennis stars. 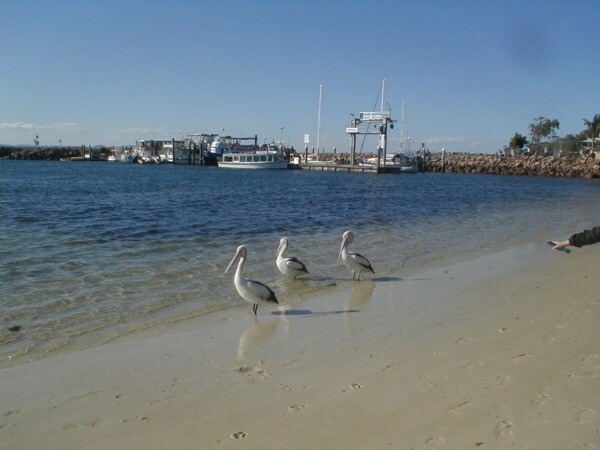 On nearby Nelson Bay we photogaphed lots of Pelicans. We had a senior moment when we went to buy a drink. The man who served us said something we couldn't understand so we just smiled and walked away. He smiled at us in a 'they are a couple of wallys' sort of way. Then i realised he was asking us if we wanted straws.